Carving a pumpkin may seem like a fun, relaxing autumn activity that you can do together as a family, but if you’ve ever actually attempted to carve a pumpkin, you know that this isn’t always the case. Carving the perfect pumpkin is possible, however, and these simple tips can help you get there safely and without too much stress. Start by choosing a pumpkin with a flat bottom so that it won’t roll around while you try to carve it. Cut the top of the pumpkin on an angle, so that once you scoop it out and replace the stem it won’t drop down inside. Soak the pumpkin in a bleach solution for one or two hours before carving to lengthen its lifespan. After you carve it, dry thoroughly and rub the edges with some petroleum jelly to prevent it from shriveling. While it may seem like a waste of money, it’s very helpful to purchase a kit of knives designed especially for pumpkin carving. Using a common kitchen knife that is too big or not sharp enough can be dangerous for everyone involved. If this is your first time carving a pumpkin, choose a pattern with bold features and large details to make it a bit easier. 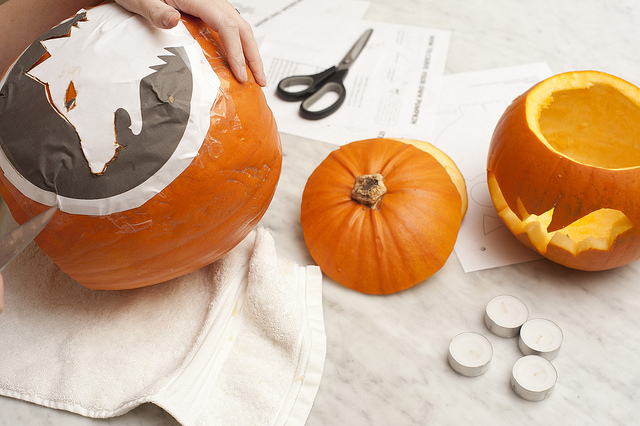 Cut out your stencil and either trace it directly onto the pumpkin or tape it on with clear tape before carving.